A tree commemorates those who died on the battlefields at Gallipoli during World War One. Seven Victoria Crosses were won at Lone Pine. In semi-darkness under pine logs, there was little space to shoot. Both sides fought with the bayonet; sometimes with no weapons- clawing, kicking, struggling-throttling one another with bare hands. It was some of the most vicious fighting of the whole War. 4,000 men were killed in the first three days. Two brothers, Benjamin and Mark Smith from Inverell, NSW, were involved in the capture of the Lone Pine positions. Mark was killed in the action. Benjamin, a Lance Corporal, noticed that the Turks had been using branches of a lone pine tree to cover their trenches. 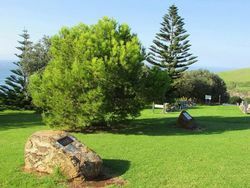 He saw that the tree had been destroyed in the battle and it is probable that his thoughts went home to Inverell where his mother was known for her 'green thumbs'. He plucked one of the cones from the destroyed tree and sent it back to her at the family property, 'Oaklyn,' Inverell. Benjamin's twin brother Bertered, also enlisted in the 1st AIF. The mother planted three seeds shed by the cone, and like the story of the three boys, two trees lived and one died. Mrs McMullen, the boys' mother, sent one of the trees (then about 1.2 metres or 4 feet high) to the opening of the Canberra War Memorial, asked that it be planted in memory of her own son and all the other sons who fell at Lone Pine. A few months later she sent the other tree to Inverell in NSW, where the boys were born and bred. 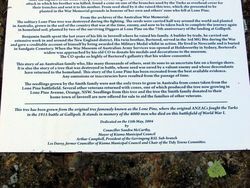 The local council planted it on the Vivian Street side of the Inverell Park where it grows today under the care of the Inverell Branch of the RSL. The tree she sent to Canberra grows adjacent to the War Memorial. It carries a plaque telling its story as well as a message of remembrance for lost friends and comrades, for all Veterans and especially for the ANZACS who stop for a while under the shade of its branches. It is a special tree. After the capture of the Lone Pine position on 6th August 1915, an Australian solider (sic), who had taken part in the attack in which his brother was killed, found a cone on one of the branches used by the Turks as overhead cover for their trenches and sent it to his mother. From seed shed by it she raised this tree, which she presented to be planted in the War Memorial grounds in honour of her own son and others' sons who fell at Lone Pine. The solitary Lone Pine tree was destroyed during the fighting. The seeds were carried half way around the world and planted in Australia, grown in the soil of the country that was at the time the enemy, and now to be taken back to complete the journey again in homeland soil, planted by two of the surviving Diggers of Lone Pine on the 75th anniversary of the landing of Gallipoli. Benjamin Smith spent the last years of his life in Inverell where he raised a family. A builder by trade, he carried out extensive work in and around the New England district. His twin brother, Bertered, served in the 3rd MG Btn during the War and gave a creditable account of himself by being awarded the Military Medal whilst in action. He lived in Newcastle and is buried in Sandgate Cemetery. When the War Museum of Australian Army Services was opened at Holdsworthy in Sydney, Bertered's widow was approached by his old CO to donate his medals and decorations to the museum. The CO spoke so highly of Bertered's gallantry that his widow consented. This story of an Australian family who, like many thousands of others, sent its sons to an uncertain fate on a foreign shore. It is also the story of a tree that was destroyed in battle, whose seed was saved by a valiant enemy and whose descendants have returned to the homeland. 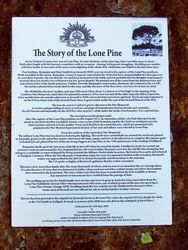 This story of the Lone Pine has been recreated from the best available evidence. Any omissions or inaccuracies have resulted from the passage of time. 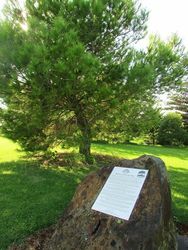 The seedlings grown by the Smith Family were not the only trees to grown in Australia from cones taken from the Lone Pine battlefield. Several other veterans returned with cones, one of which produced the tree now growing in Lone Pine Avenue, Orange, NSW. Seedlings from this tree and the tree the Smith family donated to their home town of Inverell are now for sale to aid the families of other veterans. 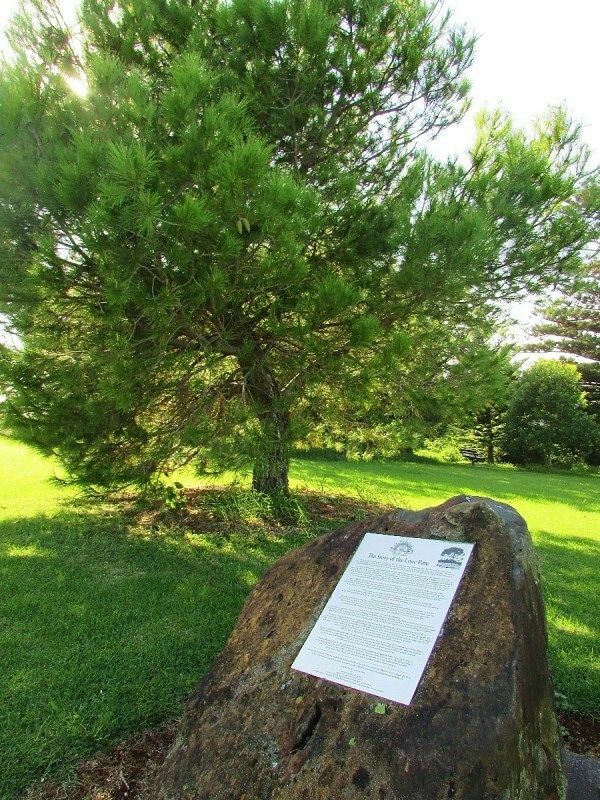 This tree has been grown from the original tree famously known as the Lone Pine, where the original Anzacs fought the Turks in the 1915 battle at Gallipoli. It stands in memory of the 4000 men who died on this battlefield of World War 1. Les Davey, former Councillor of Kiama Municipal Council and Chair of the Tidy Towns Committee.